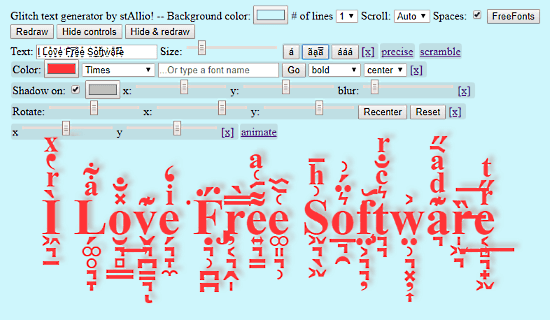 This article covers 5 free online glitch text generator websites. The glitch text, also known as zalgo text, is a form of text that is not easily readable. In the glitched text, special characters are added on top of regular text making it hard to read. These special characters can be added above, below and over the regular text. With the help of these 5 free websites, you can easily generate glitched text online. All you have to do is type or paste your regular text on these websites and select the amount glitch (zalgo) for the glitched text. After generating the glitched text, you can copy it to the clipboard and use it wherever you want to. Let’s discuss these glitch text generator websites one by one. AnimalsWithinAnimals is a free website to generate glitch text online. This website offers lots of different options which you can use to create and customize the glitch text. Here, you can generate multiple lines of glitch text by selecting the number of line at the top. When you type your text here, it shows you the output on the screen. Then, you can change the text, size, font, and color as per your liking. You can also change the background color as well. To add the glitch simply click any of the 3 levels of glitch present next to text size scroller. If you are planning to add a particular type glitches to your text, you can do that with the “precise” option. You can also add shadow to your text; this website lets you select a shadow color and adjust the shadow position. You can rotate your text at any particular angle and add custom animation effects to it. All these extra features are not for practical use. It’s not possible to copy this text to the clipboard. If you want to save it, you can either take a screenshot or record a GIF. Give this online glitch text generator website a try here. As the name suggests, GlitchTextGenerator is a free online tool to generate glitch text from normal text. Rather than having fixed options to add zalgo to the text, it lets you choose where you like to add zalgo. You can add upper zalgo, lower zalgo and zalgofy the whitespace. 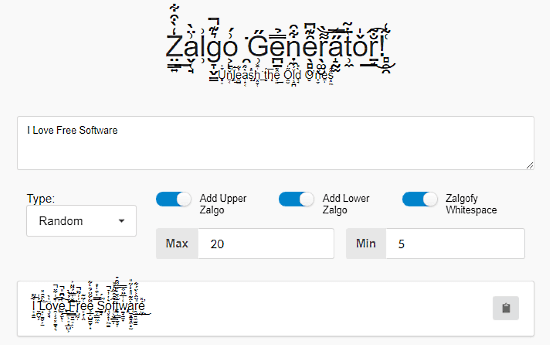 With this online glitch text generator, you can add zalgo by two different modes; Random and Progressive. In the Random mode, you can set a maximum and a minimum limit for the zalgo. Whereas, in the Progressive mode, you can define max modifiers along with begin percentage and peak percentage. To generate the glitch text, simply type/paste your text into the input text box and select the mode you want to use for the zalgo. Also, enable the desired zalgo position toggles where you want to add the zalgo. This website gives you the output in real time. You can play with these zalgo options to make the glitched text accordingly. After generating the glitched text, you can copy it to the clipboard and use it wherever you intended to. Try this online glitch text generator website here. FSymbols.com is another free website where you can generate glitch text online. To do that, simply type or paste your text in the input textbox and select the desired zalgo parameters. With this free glitch text generator tool, you can add zalgo to the top, bottom and middle of the text. You can also set the maximum and minimum height for the zalgo here. You can adjust these parameters and see the results in real time. This way, you can try different adjustments until you’re satisfied with the results. After that, you can copy the glitched text from the output textbox and paste it where you want to use it. ZalgoTextGenerator.com is another free online glitch text generator website. With the help of this website, you can generate glitched text for social media platforms. 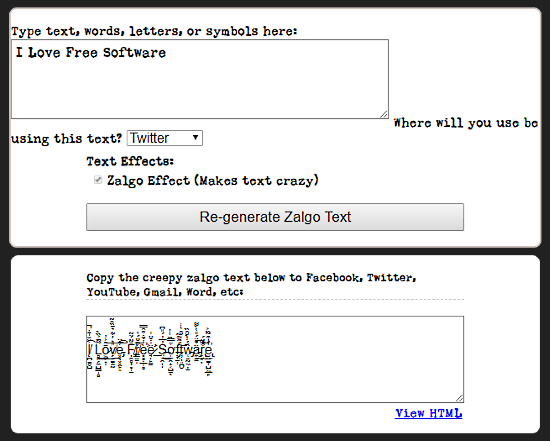 Here, you can generate glitched text for Twitter, Facebook, Email, and others. To do that, simply paste or type regular text in the input textbox and select the desired social media platforms. 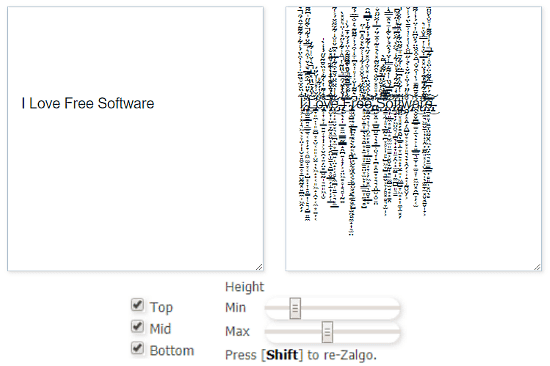 After that, click the “Re-generate zalgo text” button to generate the glitched text. This will give you a glitched version of your regular text in the output textbox from where you can copy it to your clipboard. This website also generates an HTML code for the glitch text which you can use to embed the glitched text on webpages. You can try this online glitch text generator website here. LingoJam is a very simple glitch text generator website. Unlike other websites, it just has one adjustment parameters that control the glitch level. 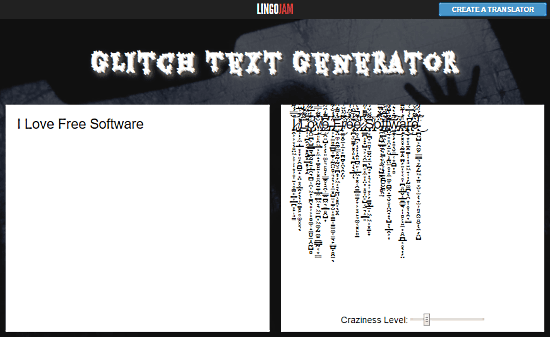 This glitch text generator shows you real-time results which allows you to try different glitch level in minimal time. To generate the glitch text, type your text in the left-side text and the glitched text will appear in the right-side textbox. You can change the glitch level accordingly and copy the glitched text to the clipboard. These are the 5 free online glitch websites. Generating glitched text with these websites is straightforward super simple. Give them a try and let us know which one you prefer in the comments.